A mix of Ascidian species arrayed (actually hitchhiking) on a gorgonian, Fiji. Diplosoma glandulosum, Globular Encrusting Tunicate. Colonial; globular tunic. Occurs in many colors. Soft to the touch due to lack of spicules. Found attached to Rhizopora mangroves. W. Central Caribbean: Belize, Jamaica. 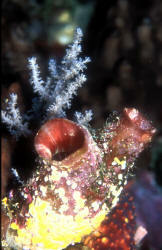 Diplosoma virens, (Family Didemnidae), Raja Ampat. 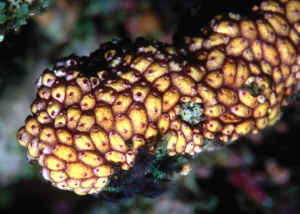 Distaplia corolla, Button Tunicate. Small (1/4" or less) oval individuals with one larger outflowing opening. Generally grow in small clusters as these are in Cozumel. Tropical West Atlantic. Found growing on dead coral. Orange or purple in color. Eudistoma cf. gilboviride (Sluiter 1909). Light to bright green with yellow overall mottling. West Pacific; Australia, Indonesia, Melanesia. Here in S. Sulawesi. Eudistoma sp. Colonies as smooth rounded masses. Typically cream, lighter grey with darker grey markings. N. Sulawesi image. Eudistoma sp. Heron Island, Capricorn Group, Queensland, Australia. Eusynstyela cf. misakiensis (Watanabe & Tokioka 1972). Indonesia, New Caledonia, Japan. Zooids about 1 cm. long placed next to each other, with a conspicuous white mark between the siphons. Typically orange-red to purplish in color. Pulau Redang, Malaysia image. Eusynstyela sp. the last possibly latericus (Sluiter 1904). Apricot colored, about 1 cm., bloated appearing zooids. Indo-West Pacific. Fiji and Red Sea images. Herdamania momus (Savigny 1816). Western Atlantic, Indo-Pacific, incl. Red Sea. To 10 cm. overall. Globular in shape, solitary, with flared oral siphons. Most are tan in color with red mottling. Look for the shrimp, Pontonia sibogae living in its branchial sac. N. Sulawesi.